This is the third post in a three part series dedicated to analyzing Call of Duty 4: Modern Warfare. Feel free to read the first part, Civilians in Call of Duty: Modern Warfare, and the second part, "Seeing the Elephant" in Call of Duty: Modern Warfare. Beware of spoilers in this post. The question about whether games can and should have overarching messages is a contentious one. Video games, perhaps more so than any other medium, foster an environment in which both the author and audience are highly active participants in creating the meaning behind the final product. Even in the case of highly scripted games like CoD 4, individual player choices and experiences have the potential to elicit a myriad of interpretations regarding the work's themes. My experience with CoD 4 was affected just as strongly by what was present in the game than by what was not present. Over the past two posts, I have argued that CoD 4's thematic strength comes from its omissions. The game's lack of a civilian presence highlights the ways in which non-combatants are transformed from people into abstract justifications for war. Also absent is combat's aftermath and wider ramifications: CoD 4's dramatic, chaotic battle scenes may give us a glimpse of "the elephant," but this view comes at the expense of a wider exploration of the beast's true destructive nature. In searching for the larger message of CoD 4, I was again drawn to the gaps in its construction of reality. After the initial shock of the nuclear explosion and the death of Sgt. Paul Jackson, I began to see the broader lesson of the character's death. While spectacular from the player's view, Sgt. Jackson's death fades into obscurity against the backdrop of the larger conflict, thereby highlighting the anonymity imposed on those touched by war. Jackson's death is jarring in terms of its suddenness and its aftermath. It is surprising enough to witness the failure of the "good guys," but even more unexpected is the sudden erasure of a character the player had grown to know. Not only is the player's relationship with the character terminated, the character's identity is stripped down to the barest details. While the spectacle of the nuclear blast was impressive, the most shocking part of the event was how quickly Jackson faded into obscurity after his death. The early portion of the game was spent following (and controlling) Jackson and his comrades. After the blast, Jackson becomes a single name on a huge casualty list and simply fades into history. The casualty list has no room to mention the many dangerous missions he took, nor does it state that he died trying to save a fallen soldier. In fact, unlike the Sgt. Jackson in the video below, my Sgt. Jackson immediately turned around after waking up from the blast, crawled over to one of the other soldiers in the helicopter, and tried in vain to rescue them. Only after seeing they were dead did he/I exit the chopper and begin searching for other survivors. Regardless of the particulars of his or the player's story, Jackson is distilled into three sterile letters: "KIA." Perhaps shamefully, I knew more about Sgt. Jackson's exploits than most of the actual soldiers who die in today's real wars. Some get their names read on the nightly news, but it is exceedingly rare to learn about the context behind their death or the life behind the name. 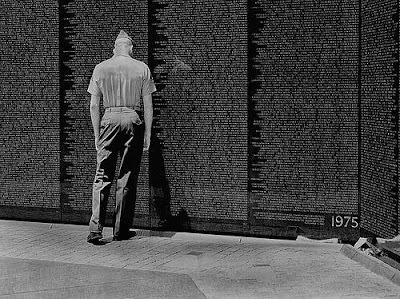 How many names on the Vietnam Memorial are those of people who died as anonymous heroes? Those fortunate enough to escape death, fall victim to a similar kind of societal amnesia. In the Iraq war, some soldiers were whisked from the front only to find themselves dropped into the battle of Walter Reed, a fight in which reinforcements are sorely wanting. Although some people avoid incurring physical scars, it is hard to make it out completely unscathed. CoD 4's ethos is a slippery one: sometimes over the top, other times poignant, the game seems to take pleasure in sampling a variety of sometimes contradictory, sometimes hypocritical philosophies. Every time the player fails, they are greeted by a quote about war. Some of these lament war's existence, others partake in militaristic pride, while several engage in gallows humor. Taken as a collection, they serve to illustrate war's existence as a set of conflicting notions mashed together to create a single ugly entity. CoD 4 shows us how the separate pieces of this creation can become lost after they are combined. Although CoD 4 highlights the characters' and the player's specific contributions during the story's pivotal plot points, the game is ultimately about the subsumption of the individual. Civilians and soldiers alike become abstract entities, the grisly realities of battle are abandoned in search of the next fight, and heroes become marks on a casualty list. In their absence however, these details become conspicuous. Simply because Call of Duty 4 leaves certain things out does not render it useless for understanding war's cultural importance. Things that start out as missing in action instead become points of learning and reflection. Thank you for this, this is one of the more intelligent analyses I've read about COD4. I considered it a landmark in game "storytelling", and highly entertaining, yet some part of me was never comfortable with the confusion of the quotes that come on screen when you die. I couldn't ever really put my finger on it, but this has put it into a meaningful and plausible context. Don't know if you're still lurking in this thread, but I'm finally catching up on comments. Thanks for stopping by. CoD 4 has been surprisingly fruitful in terms of analysis and I'm glad that other people feel the same way.